Here’s a recipe for a delicious dance movie mash-up: Gather a gaggle of gorgeous ballerinas and a few top-notch hip-hop crews. Mix in a bunch of talented classical musicians. Add killer choreography by Dave Scott. Shake well. What’s this magical cinematic concoction called? High Strung—and it’s coming to theaters this summer. 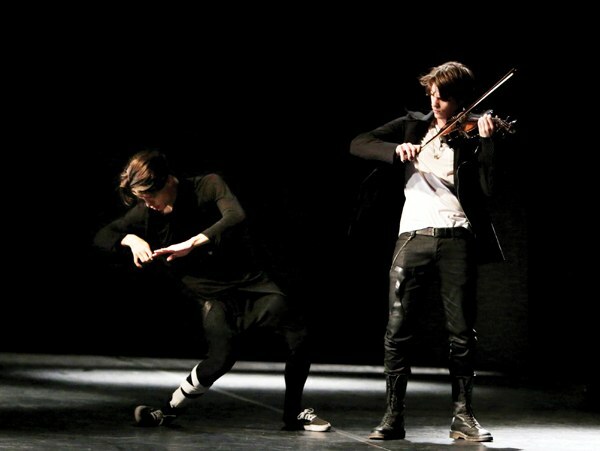 The film’s story goes like this: Johnnie (Nicholas Galitzine) is a brilliant violinist fresh off the boat from Britain who’s desperate to get a green card. In the meantime, he’s making ends meet by busking in the NYC subways. Luckily, his new friend Ruby (Mariinsky Ballet alum Keenan Kampa), a ballet student at a prestigious performing arts school, has the inside scoop on a strings-and-dance competition that could land him $25,000 and a student visa to stay in the U.S. To wow the judges, Johnnie’s going to need not only Ruby’s help, but also an assist from his neighbors: the SwitchSteps hip-hop crew. To find all of those accomplished artists, director Michael Damian, writer/producer Janeen Damian (Michael’s wife and a former dancer herself) and Scott had to cast a wide net. They held open auditions in L.A., NYC, Paris, London and Bucharest, Romania, and Scott personally recruited many of the dancers, including “So You Think You Can Dance” standout Comfort Fedoke and “America’s Best Dance Crew” alum Ian Eastwood. The ballet solo: Keenan Kampa gets the spotlight all to herself in a solo so extraordinary, you’ll end up applauding in the movie theater. The gala: Dueling violins set the soundtrack as the SwitchSteps crew wreaks playful havoc on a formal fundraiser. The finale: A creative combo of hip hop and classical ballet pulls out all the stops in an over-the-top grand finish. In a cast packed with dance talent, Keenan Kampa and Ian Eastwood shine especially bright. Maybe you know him from Mos Wanted Crew, which snagged third place on “America’s Best Dance Crew” Season 7. Maybe you’ve watched some of his virtuosic dance videos on YouTube. Or maybe you’ve caught one of his always-packed classes at The PULSE. Basically, Ian Eastwood is everywhere—including, these days, in movie theaters.